That could be the end of my story, because it really is as simple as that. But then I would not be giving credit where credit is due, for these super tasty Grilled Honey Chipotle Chicken Kebabs. We’ve made these kebabs using an indoor grill pan and an outdoor grill, works great either way. 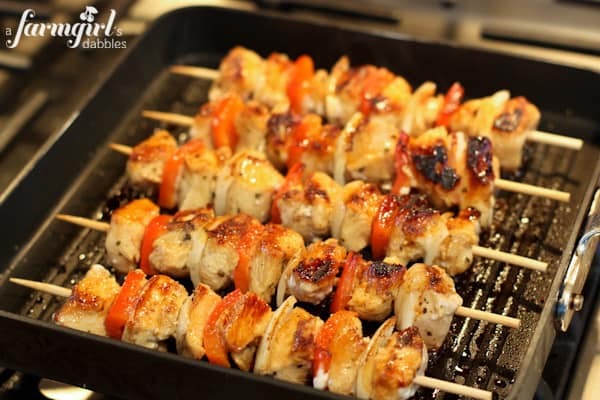 The chicken kebabs grill up beautifully, with a fabulous caramelization. They are gorgeous, with amazing finger-licken’ flavor. 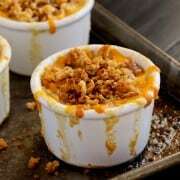 My family loves this recipe, and it now rests amongst our favorite grilled chicken recipes. 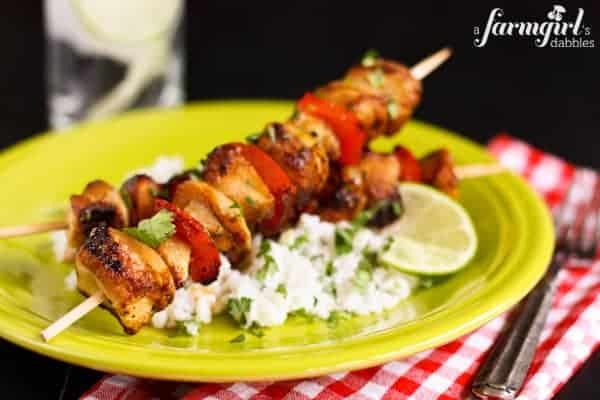 These grilled honey chipotle chicken kebabs are great for a meal any ol’ time, but would make an especially tasty and fun main entree for summer gatherings, too. The kebabs could easily be prepped ahead of time, fully assembled and then refrigerated, and then set on the grill while you enjoy the company of your guests. What a way to add flavor and fun to summer! Prepare the honey and chipotle vinaigrette. Reserve 1/4 cup of the vinaigrette and place in refrigerator. Pour the rest of the vinaigrette into a shallow bowl or sealable plastic baggie. Add the chicken cubes to the shallow bowl of vinaigrette. Marinate for at least 2 hours, or overnight (longer is better!). If using wooden skewers, be sure to soak them in water for at least an hour before grilling. I used 8 wooden skewers that were about 9” long. Heat grill pan or outdoor grill to medium-high heat and spray pan with non-stick cooking spray. Place onion and red pepper in a medium bowl and drizzle with olive oil. Thread chicken and vegetables alternately onto skewers. Discard marinade. Sprinkle kebabs with salt and pepper, to taste. Place kebabs on hot grill pan, turning the kebabs as each side gets beautifully charred, about 12 to 15 minutes total. When kebabs are almost done cooking, brush with reserved 1/4 cup of marinade and grill until done. Serve warm with cilantro lime rice. 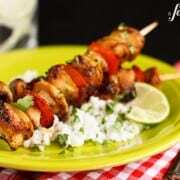 You might like these other recipes grilled on sticks! Made this two days ago and am still thinking about them. The combination is great, and it appeals to even my pickiest eater. Thank you. Wonderful! So glad you liked this recipe. Thanks for coming back to let me know! Love the honey chipotle flavor combo! I made these tonight and they were fantastic! My husband and sons loved them. Thank you for this terrific recipe! I used to beg for kabobs as a child. They carry this childhood nostalgia with them, and I love the dressing-as-marinade here. Great looking kabobs! Found you through Brandie at The Country Cook. Thank you, Sarah – I had so much fun meeting Brandi!! These kabobs look really good!You and Brandi from The County Cook made a great team in Nashville! Thank you! And I had so much fun meeting Brandi, loved getting to know her! These look amazing and I will have to try them! I will have to thank Brandie from The Country Cook for sending me your way! These look and sound amazing! Saved these to my person “to try” recipe file, yum! Gorgeous kabobs! I have to try these soon. I love kebabs and grilling. We grilled some for Father’s Day and they were wonderful. These look so good Brenda! I can’t wait to try them! We will have to make these at our next BBQ! 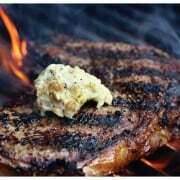 I love honey on grilled meat and these look amazing! Mmmm! I love these flavors! I love kebabs and this sounds very amazing. I love the sweet and spicy combination. Perfect summer dinner! Oh how I love kebabs too! And summer. And grilling. lol. These look fab! The marinade is really not hot. Our youngest is a bit pepper-shy, and she loved this! When used as a salad dressing, it def has more heat. But grilled, not so much. OMG Yes please! These sound incredible!! food on sticks is just fun! You had me at honey-chipotle! 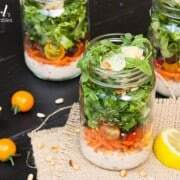 What an amazing dish with a scrumptious looking vinaigrette. I love grilling in the summer and this is right up my alley! A major yum and I love doing kebabs on my indoor grill pan too! Beautiful dish! I would gladly eat them right now!!! Honey and chipotle combo is so amazing! Great idea! We’re big kebab fans around here. And these look delicious! I love kebabs in the summer, these flavors sound wonderful! Grilled dinner perfection! I love chipotle and how it’s just so good with grilled food, and my hubby is a BIG fan of grilled kebabs! These sound incredible – love the spicy sweet flavors! 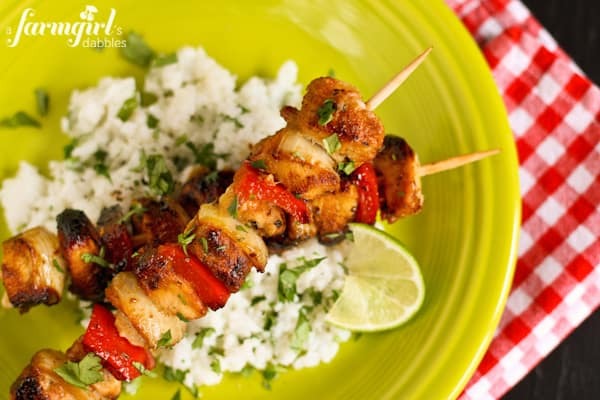 These kebabs are perfect for summer, love them!